Since I had leftover card stock from my Bloggers Challenge Spectrum Roll card, I thought I'd put it to good use and create another card. Note - this is the first run of the Specturm Roll - as you can see the colors are a bit more vibrant. I stamped my Branch/Sparrow image from Sweet N Sassy Stamps in Black Archival on my Spectrum Rolled card stock, cut my panel to size and restamped the image again. 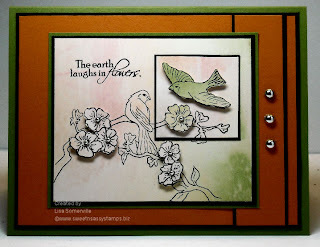 I cut out the restamped images, placed a few up on dimensionals, the smaller square panel on a black panel (Spotlighting Technique), then popped up another sparrow image on dimensionals. To add a little flair to the flowers, I added some stick one Gems, and repeated these gems using a few a tad larger on my panel strip. I love both cards and the technique is really pretty. Nice effect!